Long ago, Solitaire Kingdom was cursed by an ancient, evil spell! To lift the curse once and for all and return the kingdom to its former glory, you must embark on a great quest and defeat the dragons! Gather companions, trade coins for goods at the blacksmith’s workshop, and claim rightful victory against these ferocious beasts! 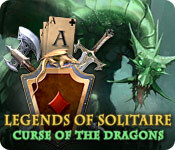 Legends of Solitaire: Curse of the Dragons is rated 4.4 out of 5 by 29. Rated 5 out of 5 by Kimmycoo from Magical There are so many things I loved about this game. I loved the narrator's voice. That added an additional spark to an already awesome game. When you keep going in knocking out cards, the narrator says words like, Fantastic, wonderful, magical ect..That was so cool. It was like Mortal Combat. I loved the challenge, the game play, the story line, long ending, achievements, the characters who follow along with you to help you on the way, using weapons to break out cards ect. If you like Solitaire, this is the one to have. I would love to see a part 2. 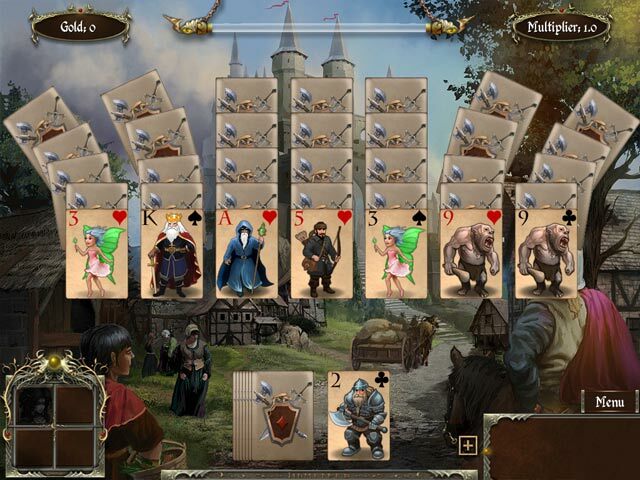 Rated 5 out of 5 by cowclaudia from One of the best This the best solitaire game I've purchased so far. Music doesn't distract from the game, lots of power ups (but a tad pricey), and love the card designs. Only gave a good instead of excellent rating on the sound since the soothing voice constantly telling me "wonderful" was a tad annoying. A very enjoyable game. Rated 5 out of 5 by Marja67 from Great game Do not understand why the bad blogs on this perfectly wonderful game. The art work is outstanding. There is an undo button. Game moves along fast so I play it steady. Rated 5 out of 5 by ClassyRider from I Could Listen To The Story Reader All Night Long! In many ways this is your typical one-up/one-down solitaire game that is moderately challenging. But, the legend tale that is told is a wonderful story in itself, and the gentleman who reads the tale has an incredible voice that draws one into the saga being told. That, to me, is what sets this game apart from so many of the others. Kudos! Of course, there are a couple of small things that I would like to see improved/changed: Please add the ability to re-play the hand if the player wants to improve his/her score; The wilds that can be 'purchased' with the score coins are specific numbered cards... If the player is purchasing multiple wilds at once, please make them different. I had some games where I kept buying a wild, hoping for a useful card, only to draw four or five of the same card #i.e. all 6's#. Finally, the power-ups for purchase in the store could be a bit more robust, as with your other games. Thank you!!! Rated 5 out of 5 by tinaluv from hang in there, it's worth it! I really enjoyed this game. I'm new to solitaire games, this was a challenge. Loved the music very much. I had a hard time later in the game, I hadn't purchased any extra's in the store to help. I checked out what the forum had to say. Then I restarted the game, bought items in the store, and put the suggestions to work from what others recommended. It was great. I hope we get more games like this. Rated 5 out of 5 by Charleen from Very cool Solitaire game This is one great Solitaire game!! Loved the story line, beautiful graphics, bright coloring! If you are looking for hours of great gaming this is one for you!! Have played it time and again never get bored of it!! Rated 5 out of 5 by 25woody53 from Most Excellent Game I have just finished the game and so wish that it would continue on and on and on!!!! The story was one of the most captivating that I have ever heard and the voice was absolutely perfect for the game and story line. I loved it so much that I have my brother playing the game. I can not say enough about this game. It was tremendous. 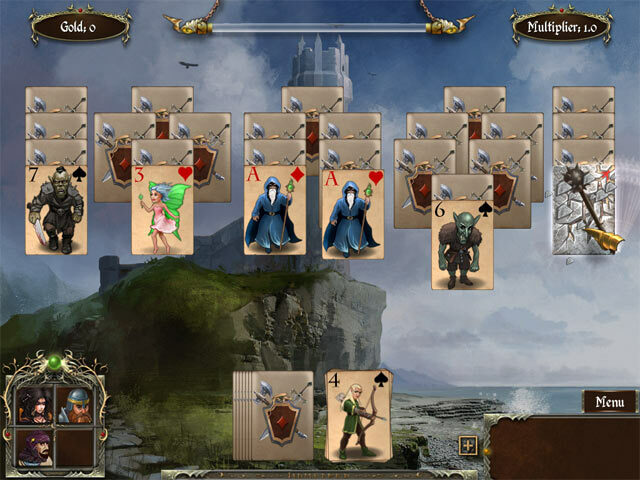 If you like solitaire games, then this is a must for you. It is a typical one card up and one card down game. Rated 5 out of 5 by zandu2 from Quite the unique story. Loved it. I gave this game a 5 stars because of the story. In the way the story is narrated, I feel that it is most exquisite and uniquely done and was well worth the play. I felt the game play was repetitive to most of the card games. The music was done well. Rated 5 out of 5 by AENEASCREEK from Best Story Teller Out There!! Wow and wow. Love this one! The Narrator of this tale has a wonderful deep DEEP kinda gravelly voice that just draws you Into the story which is well crafted and beautifully written. Yes, it's all about Evil Dragons to be conquered, nothing new here. But aside from the standard card play it just stands out from the others. The play is similar to Avalon with Fire,Ice, Vines and stone to be removed. What hooked me is the progression of the story and the narration which is top notch. The story itself is extremely detailed and if it were a book I'd probably buy it, it's that good. I have no problem giving this one 5 stars all the way! Rated 5 out of 5 by kim0530 from Legends of Solitaire I have the first one: Legends of Solitaire, The Lost Cards. I enjoyed it. This one is even better then the first. The graphic has good quality and loved the music. I played the demo and it seemed to be easy until I bought it and now it has gotten harder. So it's not boring. When an ancient curse is cast upon the Solitaire Kingdom, it’s up to you to defeat the dragons and put a stop to the evil spell!